Take a practical look at some of the basics of Buddhism on this five-week course. Buddha’s teachings are timeless, showing us how to live a meaningful life by improving our mind and finding happiness from within. On this course, learn the basic Buddhist understandings that help us to develop our inner qualities. Topics include karma, past and future lives, samsara and liberation, nirvana and inner peace, and becoming a Bodhisattva. The classes consist of teachings and guided meditations. No meditation experience or prior knowledge of Buddhism is necessary. These classes are suitable for beginners. Everyone is welcome. The class is held on Monday evenings 7.30 – 8.30pm. 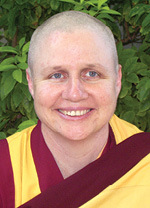 The class is held at Kadampa Meditation Centre Brisbane, 109 Leichhardt Street, Spring Hill. There is ample free street parking available. The cost for this five-week course is $75. Please book in advance.